Nepal is very small country but it has more than 865 species of birds. This book is an excellent photographic guide to the birds of chitwan and other national park, wildlife reserves and conservation area d of low land Nepal. 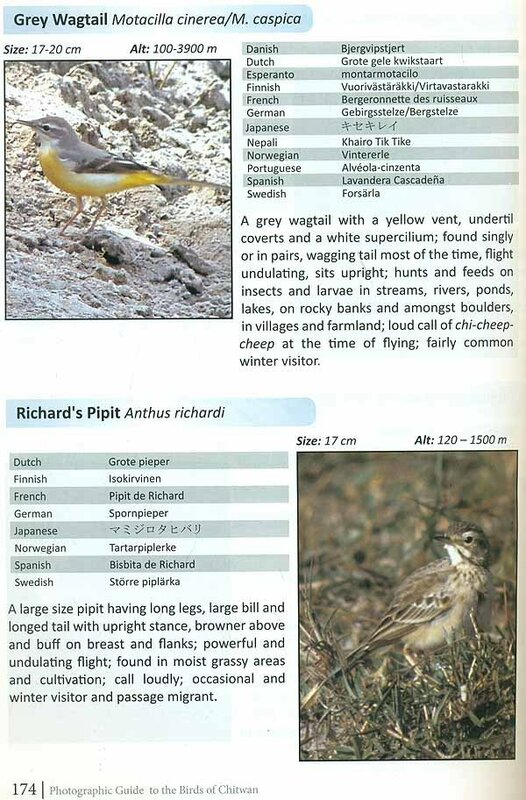 This Book is useful for novice, amateurs, specialists and interested bird watchers from all over the world. The text is simple and easy to read. 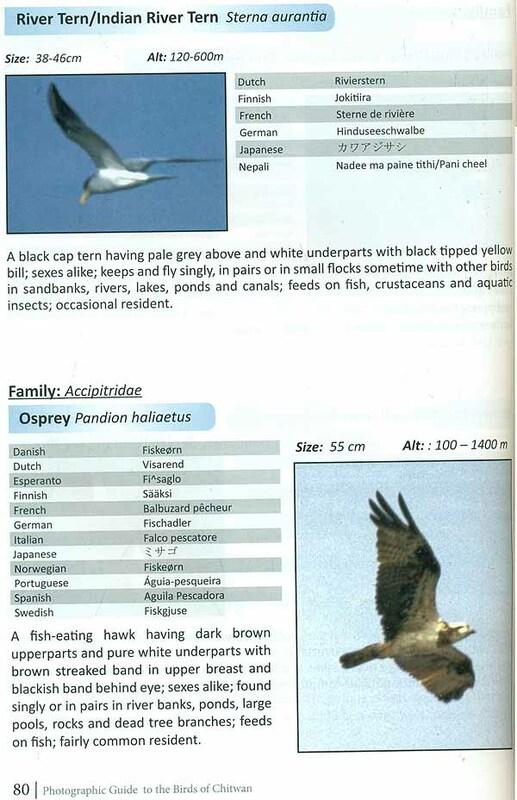 It covers general identification, habitat, calls, behaviour, food, status and distribution. The Book has tried to include maximum variety names in English and latin. 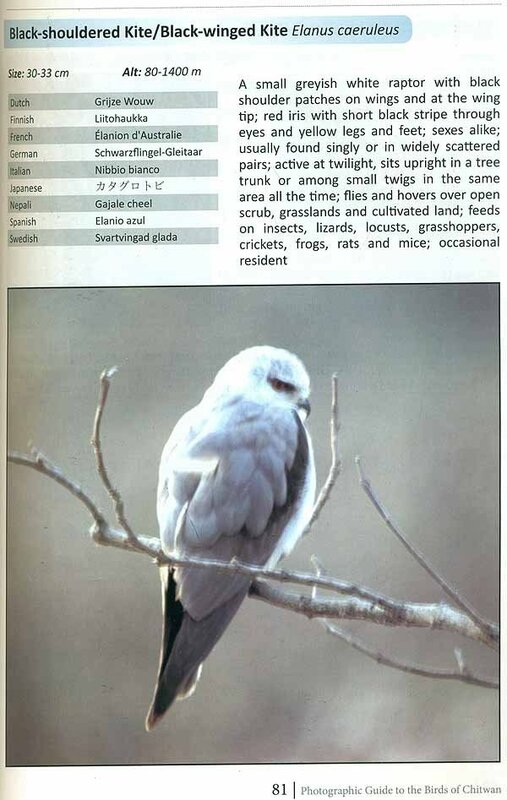 It also includes bird’s name in Danish, dutch, Esperanto, finnish, French, German, Italian, Norwegian, Portuguese, Spanish, Swedish, Japanese and local vernacular. 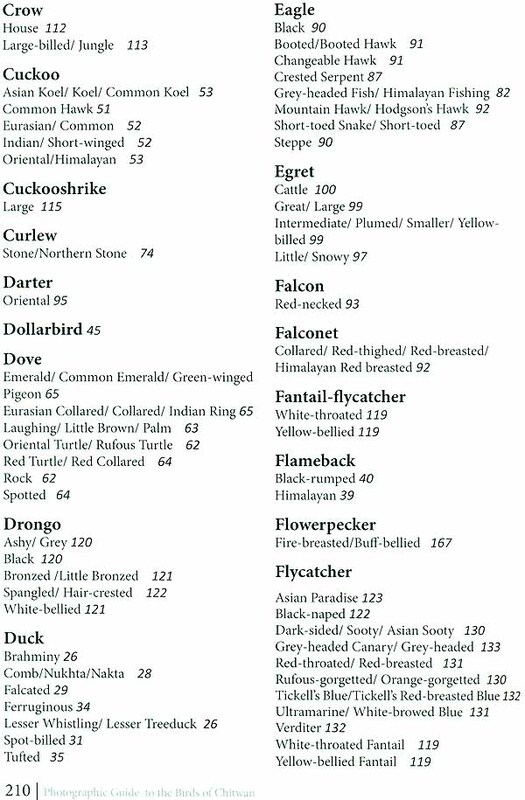 It has 13 orders, 51 families and subfamilies and 284 species of birds including 16 globally threatened species. 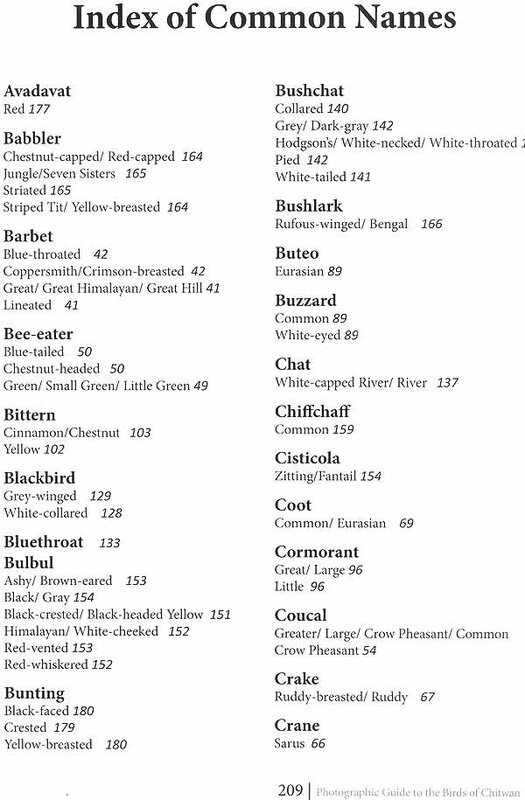 It covers more than half of the birds of chitwan. This is a very good companion for every visitor and general reader. 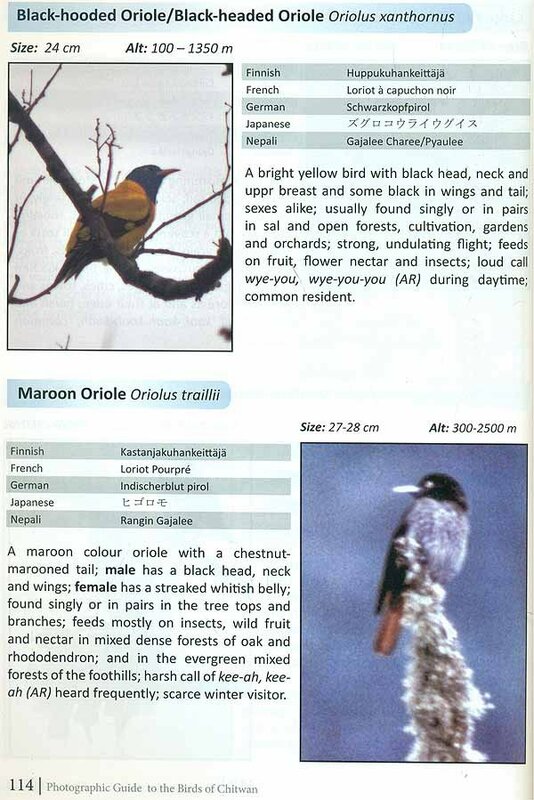 It is highly recommended to have it for the insight into birds of Nepal. Born in the heart of Kathmandu valley, Suresh Shakya is an ardent nature lover and a passionate wildlife photographer. He is a keen bird watcher, who has been involved in tourism, nature conservation and research for the past four decades. Ever since a child, I have been highly amazed by the unique features of birds and their power of flight. I used to think that birds were the happiest creatures in the world. As I grew, I started to realize the threats to these great feathered creatures. A majority of these threats come directly from humans by destroying their habitat clearing large areas of forests, grasslands and wetlands, hunting, poisoning and excessive use of pesticides. Once a abundant species of Nepal, the Pink-headed duck Rhodonessa caryophyllacea is feared to be extinct. Many species are disappearing and some are at the verge of extinction. Many Gyps vultures disappeared after the 1990's because of the excessive use of diclofenac in veterinary science. This has led them in becoming a globally threatened and endangered species. I have been studying and enjoyed taking photography of wildlife since 1976 A.D. The more, I came to know about birds and other animals, the more I became interested in them and their activities. It was then, I felt a lack of knowledge on nature and its creatures. Realizing my responsibility and love for birds I dedicated my hours to protection and conservation. 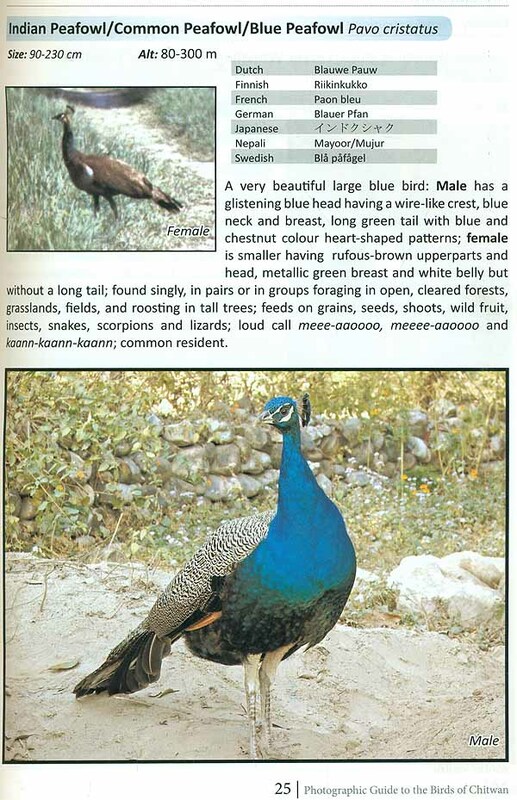 This photographic guide is an effort in dissipation of general knowledge about birds to all. It is true that a picture can tell thousands of words. 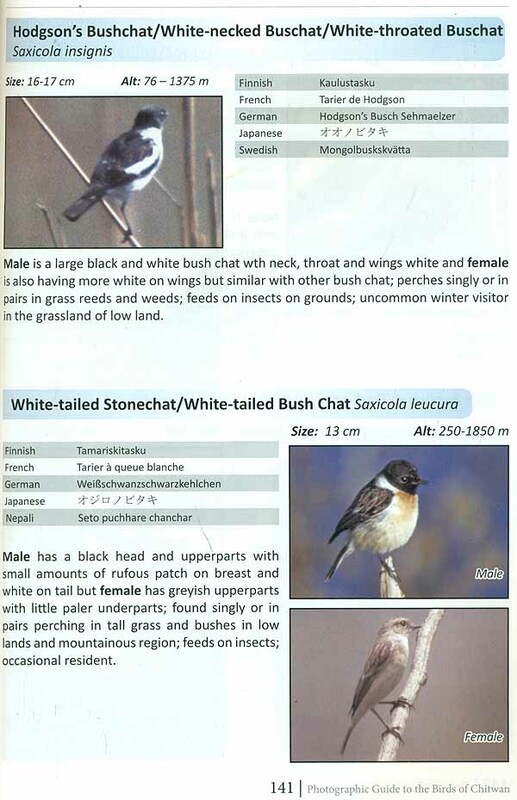 I do hope and believe that it will help one understand the birds of Nepal, especially of Chitwan and low land area. Majority of the photos were taken in the wild. This book covers more than half of the bird species of Chitwan. I hope to add the rest of the species in a later edition. Finally, I have tried hard to provide the species name in different local and foreign languages. A few of the vernacular language have been collected in the field from different sources and published literatures. 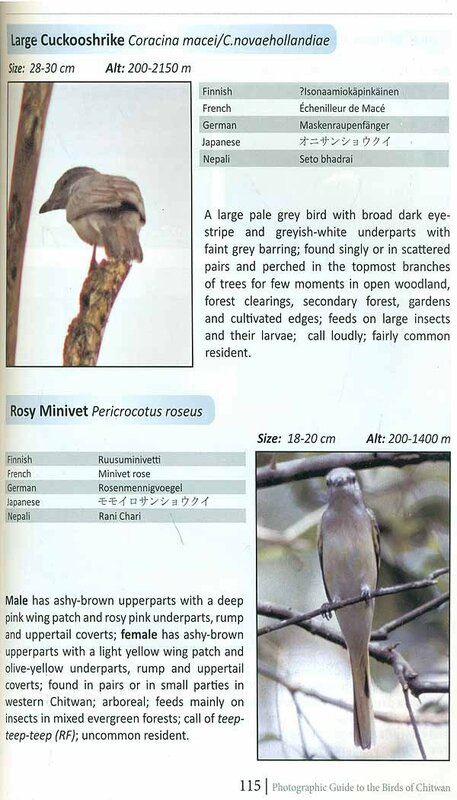 The main aim of this guide book is to present the birds of Chitwan area which is equally useful as the guide for all parts of Terai and low land of Nepal including Koshi Tappu Wildlife Reserve, Parsa Wildlife Reserve, Bardia National Park, Banke National Park and Shukla Phanta Wildlife Reserve. This guide is especially meant for novice, amateurs specialist and interested bird-watchers. It is mainly based on my field knowledge, information available in published books and literatures. The taxonomy and scientific nomenclature followed herein are broadly that of An Annotated Checklist of the Birds of the Oriental Region by Inskipp, Lindsey & Duckworth (1996). 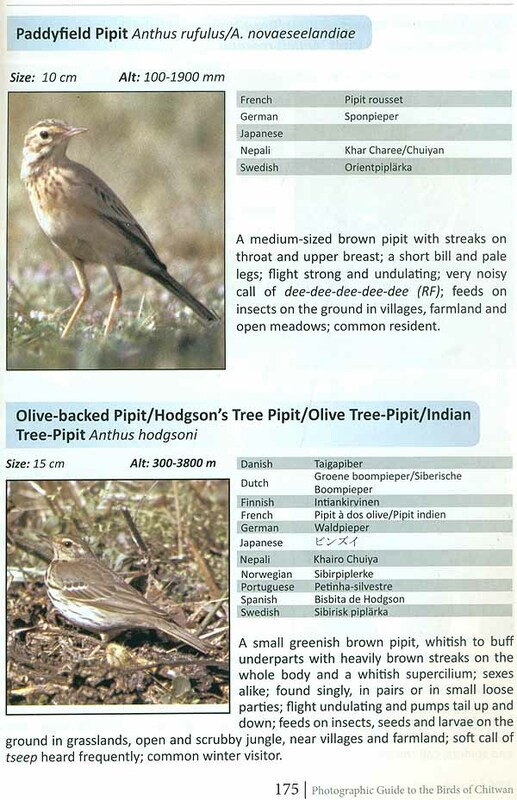 The English name and its scientific names of the bird species used by different authors are mentioned in bold type and with oblique and in italics, which is followed by different European, Japanese and popular local Nepali names as published in Glossary of Some Important Plants and Animals Names in Nepal (1991), Nepali Charaharu (2039) and The Wildlife (1999) and as I heard from Nepali villagers in different parts of Nepal. The size of bird as measured from bill- tip to tail-tip and altitude where the birds can be seen are all in approximate and average in nature. It might be different in real nature because of change in season and the age of the species. Some of the vocal species are included as I heard it in wild but different observers often hear the same call in different ways. The status, habitat, abundance and calls of the species are just as I understood from the experience in natural habitat and published literature. It might be different for different observers but tried to be in reality and minimize the error and omissions as far as possible with the help of Salim Ali and S. Dillon Ripley's standard Compact Handbook of the Birds of India and Pakistan Together with those of Bangladesh, Nepal, Bhutan and Sri Lanka (Second Edition, Oxford University Press, 1987) and Robert L. Fleming, Sr., Robert L. Fleming, Jr., and Lain Singh Bangdel's Birds of Nepal with Reference to Kashmir and Sikkim (Nature Himalayas, 1984), Richard Grimmett, Carol Inskipp and Tim Inskipp's Birds of the Indian Subcontinent (Oxford University Press, 1998) and Hem Sagar Baral and Gopal Prasad Upadhyay's Birds of Chitwan (Royal Chitwan National Park/Bird Conservation Nepal, 1998). Pictures of both sexes are illustrated where a species is clearly sexually dimorphic and wherever available. 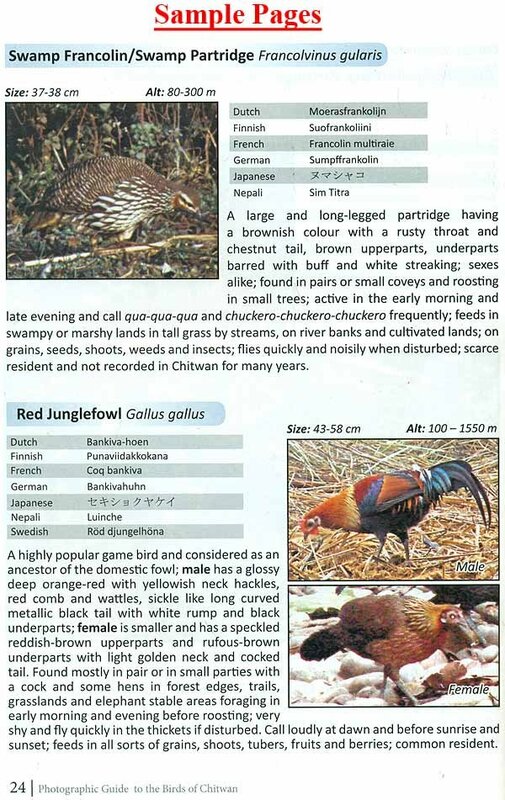 The abundance of species are stated as common for the birds usually seen, fairly common for fifty/fifty chance, occasional and uncommon for usually not seen and rare/ scarce for very unlikely and/ or only a few records for Chitwan. 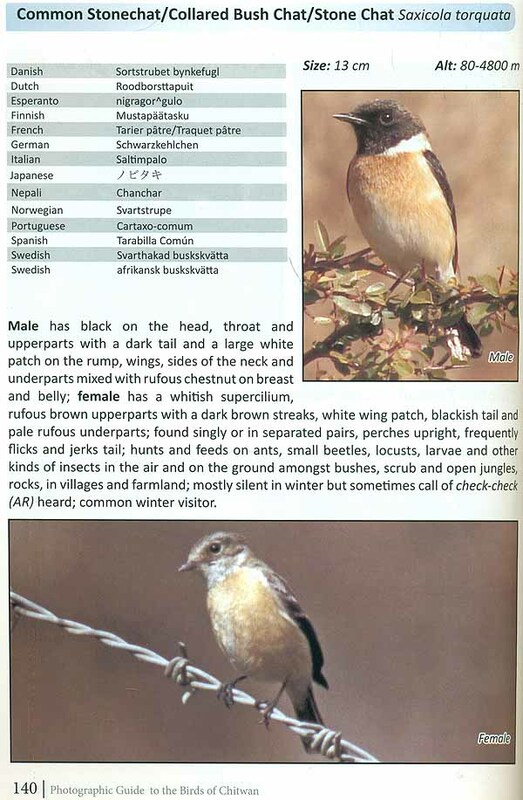 Similarly, resident means that the bird is found locally all year round in most cases, winter visitor for the birds which migrate from breeding grounds to resting grounds and summer visitor for the birds which migrate from resting ground to breeding grounds, altitudinal migrant for the birds which breeds in high altitude and winter in lower altitude and passage migrant for which the bird passes through during migration from its breeding grounds to wintering grounds and vice versa. Probably, many summer visitors and resident birds breed in Chitwan. Generally, as I understood from the nature that the autumn migration begins from the mid-August to November/December and spring migration begins from mid-February to May. The word Chitwan is derived from the word chitraban of the great Hindu epic Panchatantra. It is believed that the word is the combination of two words chitra and ban. The word chitra might have derived from chittal, which means deer and ban means forest. Therefore, chitraban means deer forest and it might have become Chitwan later on. Some other scholars opine that the very word Chitwan is the combination of two words chit or chita (heart) and wan or ban (jungle). So, Chitwan means Heart of the Jungle. Nepal lies on the southern lap of the Himalaya in Asia. In a bio-geographical sense, Nepal is at the center of Asia. Zoo-geographically, Nepal falls under the Palearctic realm to the north and the Oriental realm to the south. It is situated in between Latitudes 26'22' to 30°27' North and Longitudes 80°04' to 88° 12' East. The total area of Nepal is about 147,181 Sq. Km. It has a border with Tibet Autonomous Region of China to the north and has borders with India to the south, east and west. Non-uniform mean-width North to South is about 193 km. East-West is about 885 km. Generally, Nepal is a mountainous country and is divided into three different regions from South to North. The southern low land Terai and Siwalik ranges rise from 56 to 1000 m on average. It has a flat flood plain of fertile agricultural land, Sal forest and the Churia mountain ranges with mixed forest. It has tropical and subtropical forest with Sal Shorea robusta as a dominant tree species and grassland. The mid-mountain ranges, the Mahabharat rise to 1000 to 3900 m on average. It includes the valleys of Kathmandu and Pokhara. It has subtropical, lower, and upper temperate broad leaf forest with Schima wallichii, Castanopsis indica, oak and rhododendron as dominant tree species. The northern areas are high Himalaya. It has upper temperate broad leaf forest, high- altitude scrub land and alpine grassland with stony slopes with oak, rhododendron, Spruce, Picea, hemlock and fir as dominant species. Tree line extends up to 3900 m. on average. Chitwan is situated in the south central region of Nepal. It is about 170 km south- south-west (SSW) from Kathmandu. It is connected by Prithivi Highway and Mugling - Narayanghat Highway from Kathmandu and East-West Highway (Mahendra Highway) from Hetauda in the east and Nawalparasi in the west. It is also connected by air through Bharatpur and Meghauli from Kathmandu. Meghauli airport is not used now-a-days. The border of Chitwan is the Narayani River to the west. Makwanpur and Parsa districts encircle it in the east; Nawalparasi and Tanahu districts are to the west of the Narayani River, Gorkha and Dhading districts are to the north and Someshwor Mountain and the state of Bihar in India to the south. It lies between 27"21'45" to 27"52'30" North latitude and between 83°54'45" to 84° 48'15" East longitude. The altitude of Chitwan district ranges from 141 to 1945 meters above mean sea level. Siraichuli in the Mahabharat ranges is the highest point in Chitwan. Chitwan is a valley and aptly named Bhitri Madesh or Inner Terai. The broad, flat interior valleys are known as duns. Generally, the shape of Chitwan is more or less like a triangle. It is about 88 km. long east-west and varies from maximum 50 km to minimum 2 km north-south. The total area of Chitwan is 2238.39 5q.Km., which is about 1.52 % of the total area of the whole country. Out of this 2238.39 Sq. Km., 908.79 Sq.Km. is covered by Chitwan National Park but it has 932 Sq. Km. in total and the remaining area consists from Nawalparasi district in the west and Parsa district in the east. Chitwan has 16 Village Development Committees (VDC's), one Bharatpur Sub-Municipality (157.61 Sq.Km. ), and five Municipalities viz. Chitraban Municipality (36.41 Sq. Km. ), Khairahani Municipality (55.72 Sq.Km. ), Narayani Municipality (113.23 Sq.Km. ), Madi Municipality (238.55 Sq.Km.) and Ratnanagar Municipality (70.35 Sq.Km. ).The district has a total population of 579,984 with 279,087 male and 300,897 female as per the population census of 2011 A. D. The district has 1424 sq.km of forest, 485,438 hectares (ha) of populated land, 4677 (ha) mixed use land, 3168.8 (ha) grasslands, 12,525 (ha) river and wetland and 11,085 (ha) of roads and other settled land. The district has still about 62.92 percent of forested occupied land. Charkose Jhadi Jungle was in the southern part of Nepal in the Terai region before the Chitwan National Park (CNP) was established in central Nepal in 1973 A.D. It was an eight mile or 12 km. wide belt of forest that ran from east to west. Most of the forests were destroyed till 1950's and afterwards. These forests were dominated by hard wood trees of Sal (Shorea robusta). Many big mammals e.g. the Royal Bengal Tiger Panthera tigris, Greater One-horned Rhinoceroses Rhinoceros unicornis, Wild Asian Elephant Elephas indicus maximus, Leopard Felis pardus panthera, Sloth Bear Ursus labiatus, Wild Boar Sus cristatus indicus, Four different species of Deers (Indian Muntjac Cervulus muntjac, Sambar Cervus unicolor, Spotted Deer Cervus axis and Hog Deer Cervus porcinus), and many other mammals and birds inhabit in these forests. It was highly infested by malaria before 1960 A.D. The Chitwan valley in the middle Terai was also malaria infected area during that time. It was considered a death valley in those days. A few people like Tharu were resident in the middle of the forest of lowland Terai and Chepang in the mountain (Mahabharat) region untill then. Chitwan, in central Nepal, before 1950 A.D., was a hunting reserve, exclusively for the then ruling classes and their foreign guests. It was a very famous game hunting ground of Rajas and Maharajas of Nepal and India. Many foreign dignitaries and the royal family of Great Britain hunted there in the 1930s. It was a time when a lot of hunting of One- horned Rhinoceroses and Royal Bengal Tiger along with many other birds and animals took place. Such hunting practices were continued till 1965 A.D. One hunting lodge was erected in the middle of the forest in 1939 A.D. in Kasara for that reason during the Rana period (1846 - 1951 A.D.). The lodge was turned into the park headquarters after 1973 A.D. In those days, hunting took place in winter since mosquitoes were inactive in that season. They preferred shifting hunting which means hunters preferred hunting in different parts of the forest at different time and the forests which had been hunted in that year could recover their losses in succeeding years. A malaria eradication program was started in 1954 and malaria was completely eradicated by 1960 in the Chitwan valley and other parts of the Terai with the help of the World Health Organisation under a resettlement program. In the early 1950s, pristine lowland forests were cleared for agriculture, human settlements and economic infrastructure development. People started to migrate to Chitwan from hill and mountain regions from 1954/55 because those areas were facing food shortages and low agricultural product. So, the population rose from 36,000 in 1950 to 100,000 in Chitwan in 1960. It reached 472,048 as per 2001 population census and 579,984 as per 2011 population census. Out of that, in 2001 census, 291,754 (61.81%) were native born in Chitwan district and 180,294 (38.19%) people migrated into Chitwan. This shows that migration into Chitwan is very high even in this later period. Mainly, there are three kinds of migration in this area. First is the migration from mountain regions seeking better agricultural land under resettlement programmes. Second is migration from Bihar and Uttarpradesh of India looking for employment opportunities, and the third is migration from different districts of Nepal looking for better employment opportunities. and high yielding agricultural land, which increases the urban population. As a result, the population has increased tremendously in the whole district and a big urbanisation process has taken place. The earlier reason for migration from the mountain regions were for fundamental necessities. Later migration was because of the attraction of Chitwan as a grain producer and for employment opportunities and productive land. But, in the meantime, many animal poachers increased in the valley and even One- horned Rhinoceros and Royal Bengal Tiger were on the verge of extinction. Nepal has a unique site intervening two zoo-geographical realms and the altitudinal and climatic variation has made for a rich and varied biodiversity. The lush, moist, dense forest and luxurious grasslands of the lowland Terai are rich in different flora and fauna. The clearing of forest and human encroachment on pristine forests after malaria eradication led to several threats to the survival of wildlife and different species of plants. The importance of conserving wild species of flora and fauna was first recognized, by the then government, in 1958 and included in the First Five Year Plan (1956-61). The first wildlife legislation act the Wildlife Conservation Act of 1958 was enacted. It was followed by the Aquatic Life Protection Act in 1961 to preserve aquatic fauna, National Parks and Wildlife Conservation Act in 1973, a Forest Act in 1993, an Environment Protection Act in 1996, and Local Self-Governance Act in 1999. The Department of National Parks and Wildlife conservation (DNPWC) office was established in 1973 under the NPWC Act to conserve, restore and manage the rich and varied flora, fauna, and landscape of the country. The main objectives of the department were, and still are, to conserve the country’s major representative ecosystems, unique natural and cultural heritage, and give protections to the valuable and endangered wildlife species. It also encourages scientific research on the preservation of wild genetic diversity. As a result, the first national park was established in chitwan in 1973. At the beginning, it was meant for the protection of big mammals e.g. the one-horned Rhinoceros which already has been reduced to less than 100 individuals and the Royal Bengal Tiger, which sharply declined in 1960s due to human encroachment, deforestation, hunting and poaching. Later, it was declared a world heritage Site in 1984 A.D. by UNESCO and implementation of conservation efforts and control of poacher was effectively done. As a result, the number of Rhino has increased to 612 individuals in 2000 and similarly the number of tigers has also increased to 65 individuals in 2001. A recent census of Rhino and Tiger shows that Chitwan National Park has 503 rhinos as per 2011 census and 125 Royal Bengal Tigers as per 2010 census.